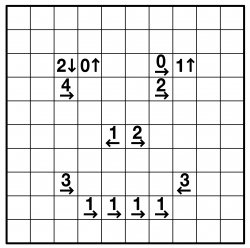 Yajilin is a Japanese logic puzzle which involves drawing a single loop through all empty squares, such that the loop doesn't touch or cross itself at any point. 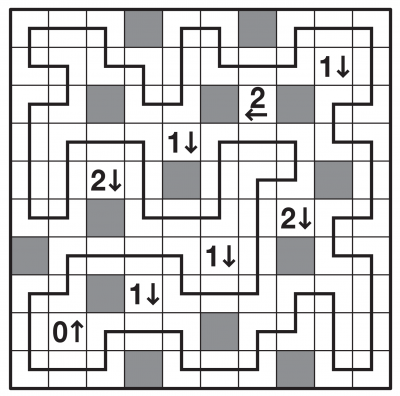 Some squares contain clues, and these reveal the number of shaded squares in the direction they point in their row or column, although not all shaded squares are necessarily indicated by clues. What you do know, however, is that shaded squares cannot touch (except diagonally). Squares with clues in can't be shaded. 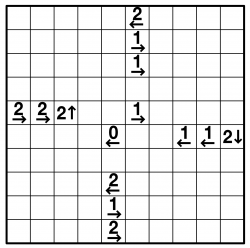 A lot of the solving logic in Yajilin comes from the need to have the loop visit every unshaded square, and often a surprising number of loop segments can be drawn rapidly from even a single clue. The puzzles can range from simple logic through to requiring far more complex levels of reasoning.